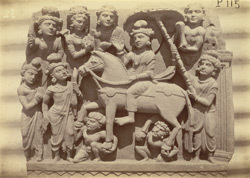 Photograph of a Buddhist sculpture from Loriyan Tangai, taken by Alexander Caddy in 1896 depicting the departure of Prince Siddharta from the city of Kapilavastu. The Prince is riding his favourite horse and two small figures are holding onto its hooves to stop them from making a noise and alerting those who would stop Siddharta from leaving. In front of the horse is Mara (The Evil One) who is trying to deflect the Prince from his purpose. This style of sculpture, influenced by Graeco-Roman elements, is known as Gandharan and takes its name from the ancient kingdom of Gandhara (Peshawar) which, together with Udyana (Swat), corresponded fairly closely to the northern part of the North West Frontier Province.